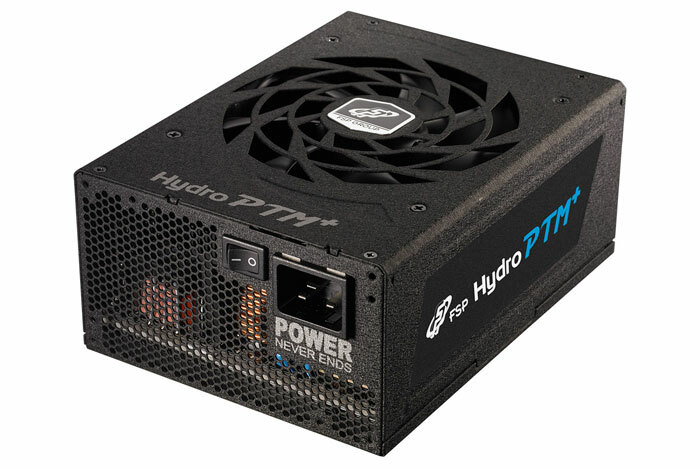 HEXUS reported upon the unveiling of the FSP and Bitspower Hydro PTM+ liquid cooled PSU ahead of Computex last year. It was claimed to be the “world's first mass produced liquid cooled PSU.” Now, at last, FSP has got around to ‘mass producing’ this 1400W PSU. In an email to HEXUS this morning FSP said that the Hydro PTM+ is available now at a MSRP of US$699. At the top of the list you will see that this beefy PSU is described as “up to 1400W”. That is because without liquid cooling equipped/running it acts as a 1200W PSU. In its email to HEXUS, FSP says that the liquid cooled PSU runs passively when power demand is lower than 50 per cent. Without the liquid cooling system enabled it runs passively until it hits 30 per cent power draw, after which the built-in single 135 mm FDB fan spins up. FSP is very assured about the quality of the PSU and its components. For example it is said to come equipped with Japanese made E-caps, to provide reliable power and a prolonged lifespan. The design is based on a single 12V rail with a DC-DC module for supreme efficiency and voltage stability. A wide range of protections are offered to end users such as over-current, over-voltage and over-temperature protection. If you head on over to the official product page, you will read that FSP is marketing an initial limited edition 500 unit product run. 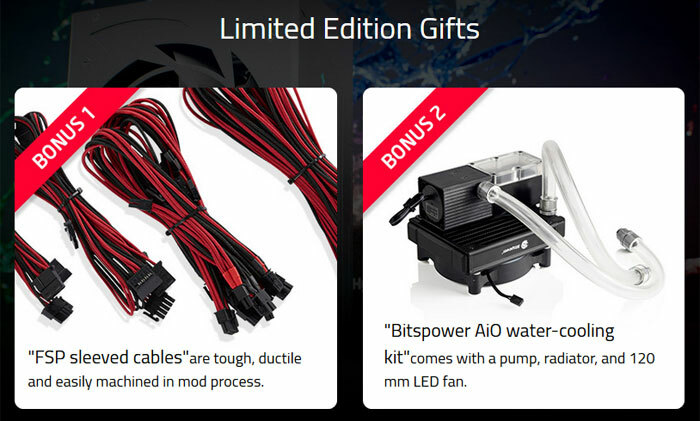 This hardware release includes stylish FSP sleeved cables and the Bitspower AIO water-cooling kit (with pump, radiator, and 120 mm LED Fan). Please note that neither the regular nor limited edition Hydro PTM+ includes coolant, for those that want to integrate this solution into their custom systems. A list of distributors in America, Europe, Asia Pacific and the Middle East / Africa is provided on the FSP product page. However, I couldn’t see a UK distributor listed. Complete nonsense.. PSU efficiency is so good nowadays, I can't see the purpose of this product. To make your mates jelly! For the techie who has everything! I can - if you are doing lots of video rendering, or cryptocurrency mining. And if you work in a cold basement, a 1.4kW heater might be very welcome. I see only one purpose, to extract money from wazzocks with more money than sense. Decent PSUs make so little noise these days that I just don't see the point in this at all.